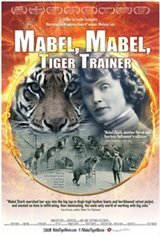 MABEL, MABEL, TIGER TRAINER is the third documentary by award winning documentarian Leslie Zemeckis about the world's first female tiger trainer, Mabel Stark.During the heyday of the circus, Stark thrilled audiences with her 18 Sumatran Tiger act, the meanest of all tigers with Stark surviving countless life-threatening maulings. Her body was a 'network of scars. 'Born into poverty in Tennessee, Stark was raised on a tobacco farm in Kentucky. She ran away, eventually joining the circus as a cooch dancer. Always an outsider, Stark clawed her way up to the circus hierarchy, working with goats, riding the horses and training lions. But it was the tigers she fell in love with.It wouldn't be until she married a renowned big-cat trainer that she was given a chance with the 'stripes.' The marriage wouldn't last (nor would the three or four that followed), but Stark's enduring love for the tigers would.She hand-raised many tigers, walking them on the beach of Venice, California, and tucking them in to sleep at home.Eventually, she taught one tiger a wrestling act that horrified the gasping audience as the 300 - 400 pound animal leapt onto Stark's back and brought her to the ground. Nothing stood between the petite blonde woman and death, save a whip and a chair.Stark was determined that nothing, and no one would get in the way of her relationship with the cats; not even a husband who was an embezzler.During the 1920s and '30s, there was no bigger name than Stark's on the circus marquee, and for more than 30 years she trained and performed at the renowned Jungleland in Thousand Oaks, site of movies such as DOCTOR DOOLITTLE and all of the TARZAN films. She also worked Hollywood films, doubling for Mae West.MABEL is the story of a woman who would do anything for her tigers. "'It is a matchless thrill and a life without it is not worthwhile... I hope each new season until my number is up will find me shouting 'Let them come.'" - Mabel StarkAs the world of the circus, an American institution for decades, is being phased out today, Mabel Stark's world will never be seen again. The documentary reveals Stark's story is told in her words, as well as those of her relatives, protégés, and today's female tiger trainers who follow in her footsteps.